If you’re familiar with the Grammy-nominated artist Dirty South and his latest track “Find A Way” ft. Rudy, you’ll love to hear that an acoustic version of the track has been performed and well received on Revolt TV. 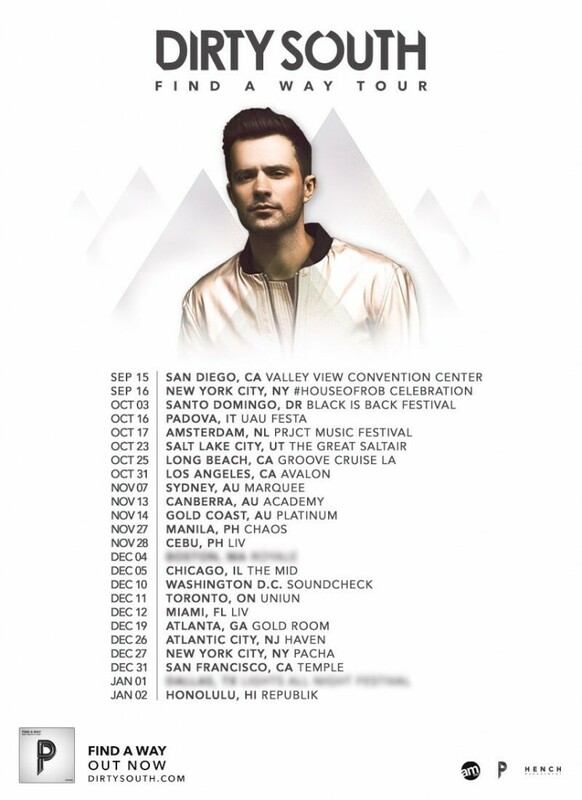 With the success of the track, Dirty South is embarking on a Find A Way world tour that spans almost every continent and runs from September 15th through January 2nd. While Dirty South will be busy on the tour, I highly suggest checking the picture above and finding a date where you are able to get to so you can check out this awesome tour. While there are a few dates blurred out for surprise New Year’s Eve shows and on December 4th, you can currently get tickets from www.dirtysouth.com for the city of your choice. Hurry up as Dirty South may make his way to a location nearest to you before you know it and you do not want to miss this!